In the words of Emily Dickinson: “A little madness in the spring be wholesome even for the king” and, indeed, all over the world this season seems to be perpetually associated with madness, magic and mysticism. In the western world, spring is associated with two festivals in particular: May Day and Beltane. Traditionally an occasion for popular and often raucous celebrations, the pagan festival of May Day lost its religious character when much of Europe became Christianized. However, it still remained a national holiday in many countries and in the 20th and 21st centuries many neopagans began reconstructing the old traditions and celebrating May Day as a pagan religious festival again. 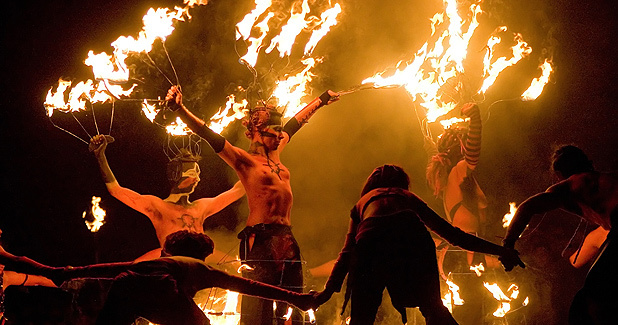 Also revived in recent years was the Celtic festival of Beltane (or ‘Bel’s fire’, named in honour of the deity Belenus), when fires were lit to signal the beginning of summer. However, spring festivals are by no means limited to Europe – in India the season sees the celebration of the raucous festival of colours known as Holi; Akitu was the spring festival in ancient Mesopotamia; and in Vietnam the celebration of Tet in February marks both the New Year and the beginning of spring. After a winter that (at least on this side of the pond) seems to have gone on forever, now seems the perfect time to celebrate the rites of spring. May Day has been a traditional day of festivities throughout the centuries. The earliest May Day celebrations appeared in pre-Christian times, with the festival of Flora, the Roman goddess of flowers, and the Walpurgis Night celebrations of the Germanic countries. In Britain, traditional May Day rites and celebrations include morris dancing, crowning a May Queen and anything involving a Maypole. Much of this derives from traditional Anglo-Saxon customs associated with Thrimilch (literally ‘the month of three milkings’) – the Old English term for the month of May. In the years since then, May Day has become most associated with towns and villages celebrating springtime fertility and revelry with village fetes and community gatherings, although the particular traditions tend to vary from region to region. Whitstable in Kent, for example, hosts annual Jack in the Green pageants, in which a procession of morris dancers parade through the town on the May Day bank holiday. Padstow in Cornwall, meanwhile, holds its annual ‘Obby-Oss’ (Hobby Horse) day of festivities. This is believed to be one of the oldest fertility rites in the UK, during which the whole town is decorated with springtime greenery, and every year thousands of onlookers attend. Revellers dance with the Oss through the streets of the town and even through the private gardens of the citizens, accompanied by accordion players and followers dressed in white with red or blue sashes who sing the traditional ‘May Day’ song. The university cities of Oxford, Durham and Edinburgh annually see students take to the streets in their hundreds in the early hours of May morning to see the sunrise and enjoy festivities including folk music, dancing, madrigal singing and a barbecue breakfast (although as students, let’s face it, they don’t need much of an excuse to party!). Edinburgh is also the setting for an ancient Fire Festival that is held on the evening of May eve and into the early hours of May Day on the city’s Calton Hill. An older Edinburgh tradition has it that young women who climb Arthur’s Seat and wash their faces in the morning dew will have lifelong beauty. Celebrated on 1 May – and thus linked inextricably with May Day – Beltane is a spring-time festival of optimism. Fertility ritual again was important, in part perhaps connecting with the waxing power of the sun, symbolized by the lighting of fires through which livestock were driven, and around which the people danced in a sunwise direction. In Ireland, where the festival survived in its original form for longer than in most places, bonfires were lit to safeguard against disease and Druids used to make them with great incantations, amid solemn ceremony. The fires would mark a time of purification and transition, ringing in the season in the hope of a good harvest later in the year, and were accompanied with ritual acts to protect the people from any harm by Otherworldly spirits. Like the festival of Samhain, opposite Beltane on 31 October, Beltane was also a time when the Otherworld was seen as particularly close at hand. Beltane was equally popular in the Scottish Highlands, where young people met on the moors, lit a bonfire and made an oatmeal cake toasted at the embers. The cake was cut and one of the pieces marked with charcoal. Drawing the pieces blindfolded, whoever got the marked piece would have to leap over the flames three times. Another common aspect of the festival, practiced far beyond the shores of Britain and Ireland in the New World of North America, was the hanging of May Boughs on the doors and windows of houses and the making of May Bushes in farmyards, which usually consisted either of a branch of rowan/mountain ash or more commonly hawthorn. With such rich traditions, it is perhaps unsurprising that many of the pagan rites of spring continue to be celebrated to this day, despite the rise of Christianity and the later secularisation of society. The lighting of a community Beltane fire from which each hearth fire is then relit is still observed today throughout the Gaelic diaspora. May Day and Beltane-based festivals are widely held by many Neopagans. Wiccans celebrate a variation of Beltane as a Sabbat, one of the eight solar holidays which make up their Wheel of the Year. Such festivities are also by no means limited to Neopagans or the Celtic fringe. On May Day, Romanians celebrate the “arminden”, the beginning of summer, symbolically tied with the protection of crops and farm animals. In Finland May Day is known as Vappu, when carnival-style street festivals are held throughout the country, while in Hawaii, it is called Lei Day, and is normally set aside as a day to celebrate island culture in general and native Hawaiian culture in particular. All of this shows that perhaps the beginning of spring and the festivals associated with it are no longer restricted to having a particular religious significance but have grown far beyond that. Now May Day is just a good excuse to throw a great party and be thankful that, for a few months at least, the days will be longer, brighter and warmer. If that’s not worth celebrating, I don’t know what is! Newly living in Sweden, I asked a Swedish friend of mine what the significance of the giant bonfire the community was hosting on the night of April 30. He didn’t know, said it was just fun. Thanks for your post, which added some additional illumination to the rite. A very beautiful post – thank you! I suppose you weren’t really looking at the political so much, but in England May Day is also Labour day, and there are marches that many of the Unions take part in celebrating worker’s solidarity and achievements. I say in England because although Labour Day is international, I think it happens on a different day in quite a lot of countries and I didn’t want to make incorrect generalisations. An interesting addition to an old tradition, perhaps? I had a lovely Beltane jumping fires in my garden, really feel like WInter is gone now. the brush of a flushed cheek. carnations, orchids, and a potpourri of cologne. drone of real life begins. for a fertile new year. classic rock and market futures. of coffee a good half day past. has kept the dust down…so far. A.C. blast, lights to warm on a sunlit window. of the nation and the hopes of the sower. maybe some new windows on the house. in the neighboring field and waves cheerfully. summer nights…and maybe a spring wedding. the underbrush, peering from lofts and barns. for the fuel aplenty to finish this campaign. sure her long flowered sundress is free. tries to lift it skyward. applause, echoed by the shivering poplars. copse nestled in a quiet dell. before tenderly placing it atop the marker. Believe it or not, I wrote it all in a couple hours. All of my Poems/Narratives start as Visions or Lucid Dreams[Pretty straight up as there was no pharmaceutical influence at work-not that I’m knocking that…many Cultures wouldn’t have it any other way.